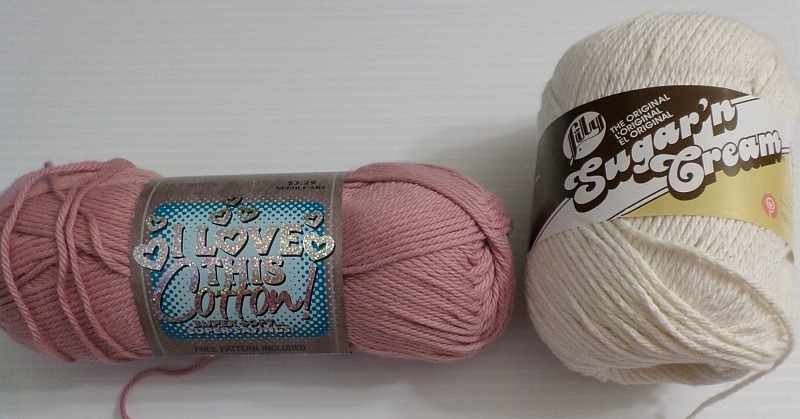 The worsted weight cotton yarns I’m most familiar with are Sugar ‘n Cream (available at JoAnn and Michaels), Peaches ‘n Cream (available at WalMart), and I Love This Cotton (available at Hobby Lobby). 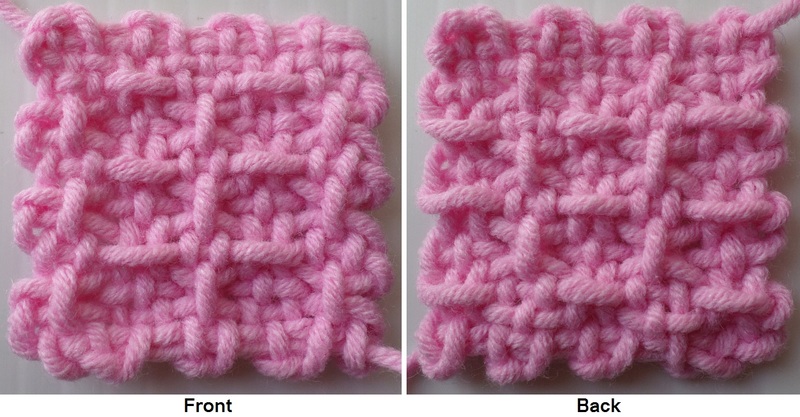 The only one I can recommend is I Love This Cotton—this is slightly thinner yarn and it’s softer than the others. 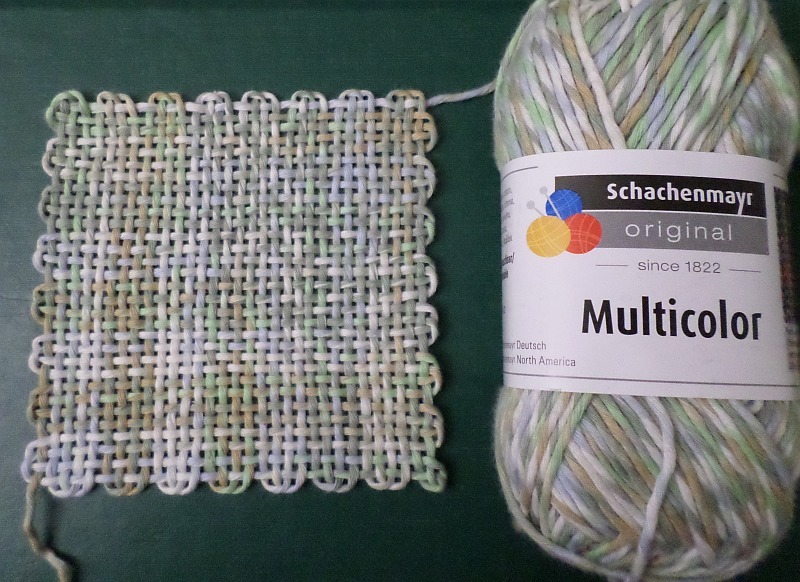 I know there are weavers who use the ‘n Cream cotton yarns on the pin loom, but I can’t make it pleasurable to work with. Every square I’ve woven with ‘n Cream yarn has been tortuous. 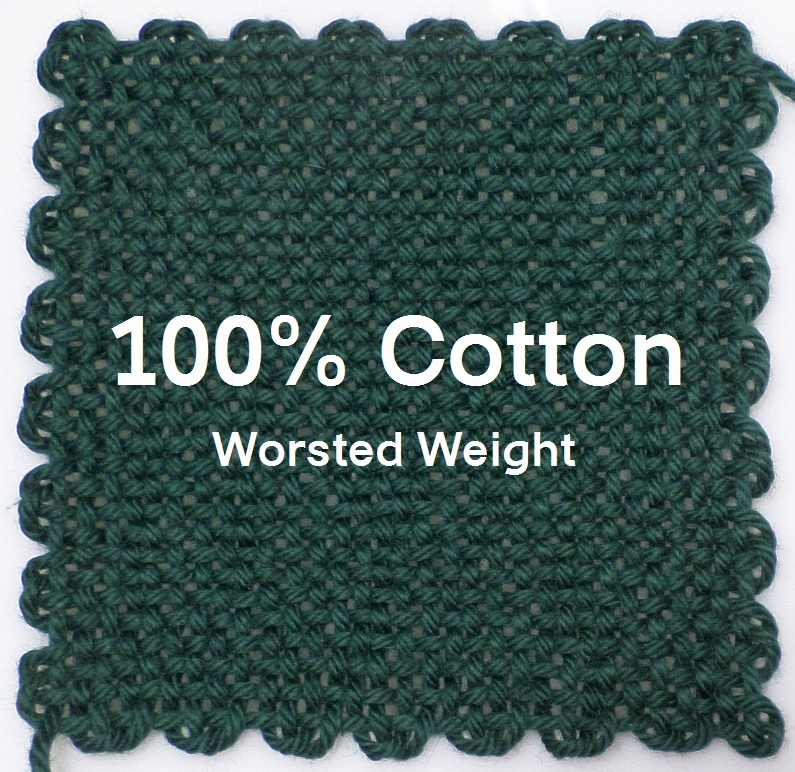 There are of course other brands of 100% cotton yarn. I picked this one up at my local yarn shop, and don’t know how readily available it is. It’s 100% cotton, DK weight—I think. It worked well, but you can see it’s a slightly loose weave. Unless you NEED 100% cotton, I recommend a cotton blend for the pin loom. 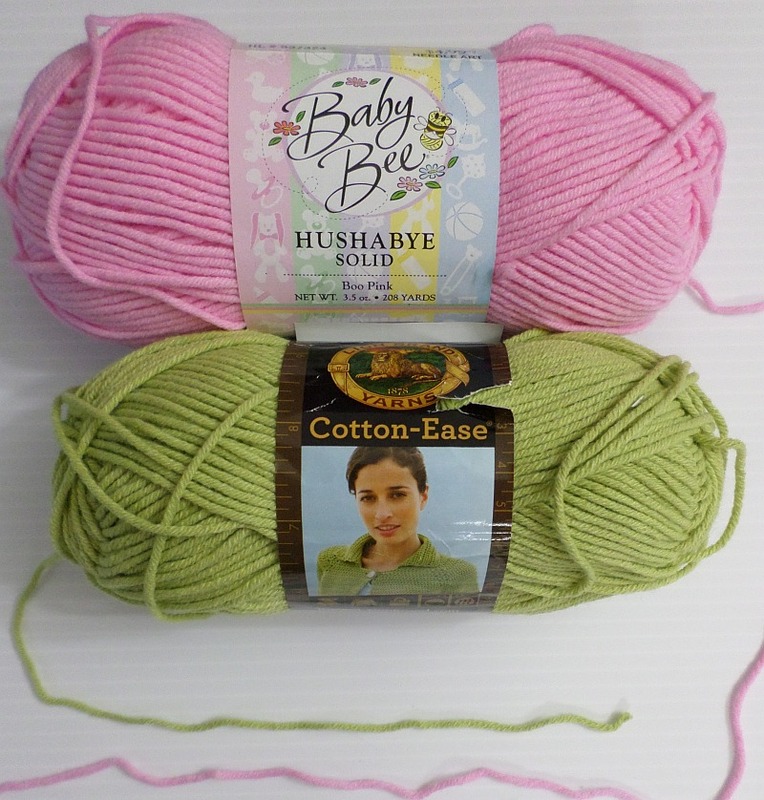 Baby Bee is available at Hobby Lobby; Hushabye is a dense yarn, a little too thick for our pin looms, so I don’t recommend it. I don’t think Lion Brand makes Cotton-Ease anymore which is too bad because it’s quite nice to work with. 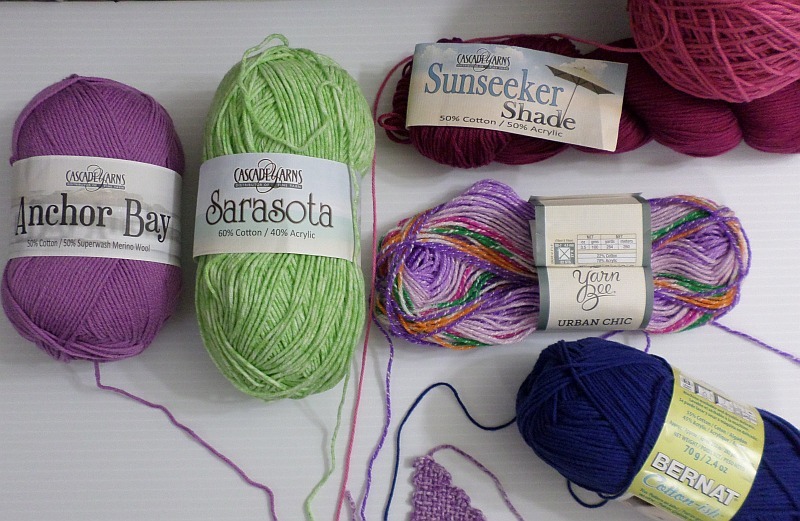 If you want to go down to a DK weight yarn, there are a myriad of choices in cotton and cotton blends. These will usually give you a slightly open weave. 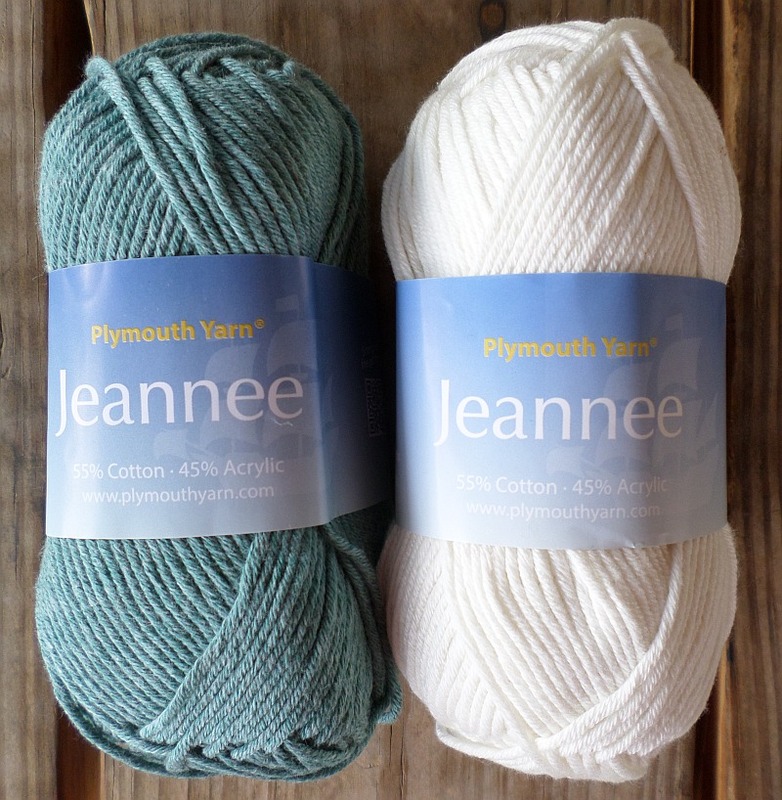 Plymouth Jeannee — classified as DK weight, but on the slightly thicker side. It will give a tighter (or closer) weave than many DKs and will shrink a little, but its original appearance is not drastically affected. Berroco Modern Cotton (60% Pima Cotton/40% Modal Rayon) is also DK weight, a titch thinner than Plymouth Jeannee. It’s very slick and smooth to work with. It has a little give to it, so you don’t have to warp super loosely. I don’t recommend thin cotton yarn on the 1/8″-spaced pin loom, but you’re welcome to try it out. 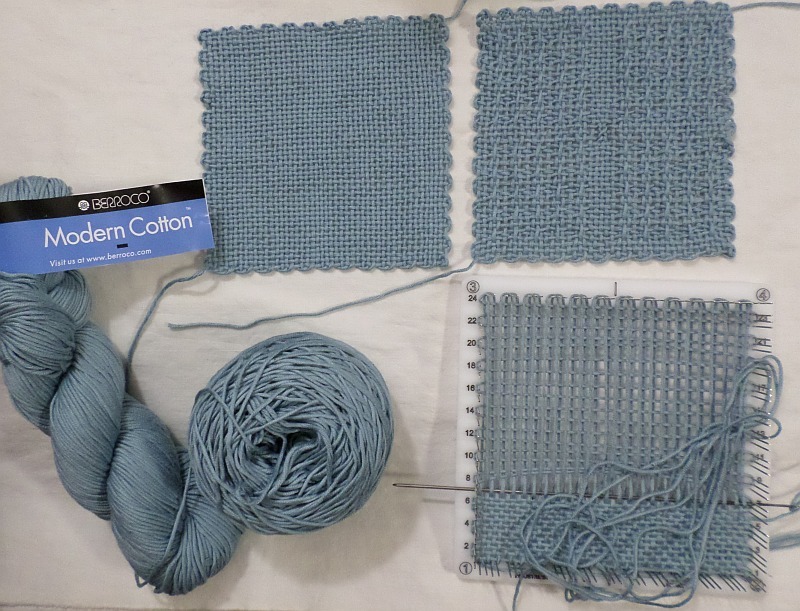 The photo below shows thin cotton compared to worsted weight acrylic (aqua), Jeannee (turquoise), and Urban Chic (sportweight, purple). I’m not a fiber expert, so I can’t extol the virtues of cotton or cotton blends. 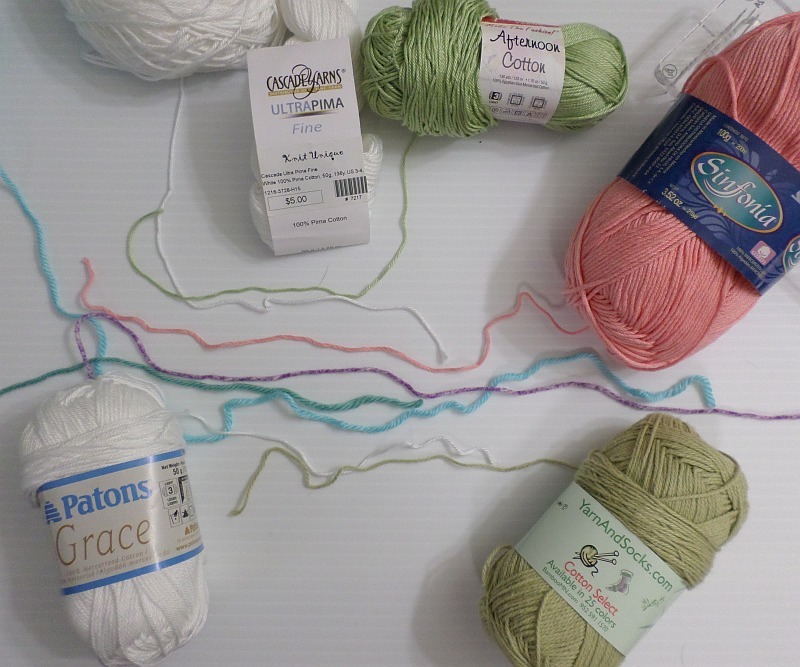 I like them both and I like having many yarn (and color) choices for pin loom weaving. Thank you for this very detailed explanation of yarns. It was truly appreciated, as are you. You’re welcome! It’s nice to get feedback so I can know if anyone wants me to continue the series.